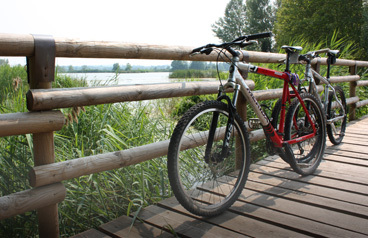 Would you explore Iseo Lake and Franciacorta region by bike? 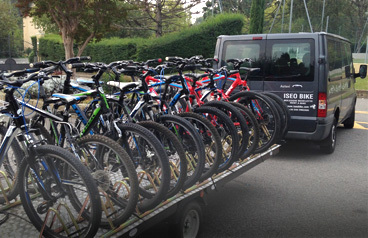 Iseo Bike rents out city bikes, mountain bikes, and Electric bikes, available to individuals, families and groups. Our bikes can be rented whether for just a few hours or some days. Rent your bike and choose between a self-guided cycling tour around the lake and one of the various itineraries that you can find detailed on this website. A mountain bike guide can lead you through off-the-beaten-track trails, enjoying breathtaking nature sceneries and landscapes. You find us at the entrance of Campsite "Del Sole", where we rent out also canoes, kayaks, sups and padalos, giving you the opportunity to get in closer touch with the lake. We can finally transport and deliver the bike to your home or accommodation. What are you waiting for? Call us to book… and get on your bike! Find out how you can make your family vacations beside the lake fun: plan a bike trip discovering the beauty of our region! We rent out adults' and children's city bikes and mountain bikes, even for 1 hour only! Would you spend a pleasant day with your friends? Come and take part in our guided tours or in a wine ride. You'll find the right cycling tour according to your wishes! Are you spending your holidays beside Iseo Lake? Book your bike for as much time as you want and feel free to plan your perfect tour, which can directly depart from your campsite or hotel. Contact us and get to know the best itineraries! 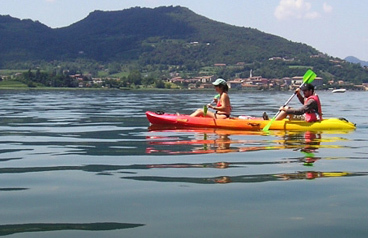 Are you planning a group trip to Iseo Lake or Franciacorta? Book one of our guided bike tours and we'll make your client vacations memorable! You can book our bikes by phoning Iseo Bike or filling out the request form. Find out the hire rates by clicking the button below. The best way to get in closer touch with the lake is to rent a watercraft, discovering from the middle of the lake how enchanting it is. Iseo Bike can deliver the bike to your home, accommodation or at the starting point of your tour.